Da da da da da da dah. Da da da da da dah Bat Dress! Okay, maybe the idea of having a fashionable Batgirl look doesn't immediately grab you like it does us, but indulge us for just a moment, because we are some SERIOUS costume geeks. This dress has all the style of the DC comic character, but it also has a costume look that is seriously FUN! Hey, spandex and body molded armor simply isn't meant for every situation, especially not a party situation. Be heroic in this DC Women's Batgirl Wing Dress, and we're sure the denizens of Gotham City will immediately come to know you as the top crime fighting lady. You can bet that will look good on a résumé. The embellished Batlogo has a glittery gold finish and perfectly accents the sleek black body of this long sleeve dress. The attached vinyl cape makes you feel heroic, and will most likely come in handy should you have to do battle with any baddies! 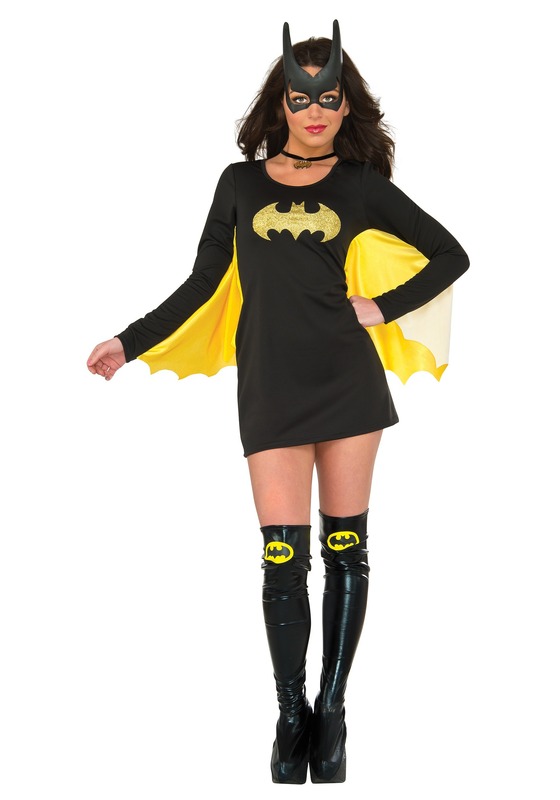 Upgrade the style with a Batgirl mask and knee high boots, or just wear this dress as nonchalantly as possible with your favorite heels and necklace. We're sure that having a cool cape like the one on this costume dress is going to help you make one heck of an entrance at any big gala event!